Recent isotopic analysis of pig remains from several ceremonial sites in the Stonehenge area show that the swine and celebrants sometimes came from as far as what is now Scotland and Wales. It has not been uplifting for Americans to look across the ocean the past few years and see Great Britain's Brexit imbroglio. Almost three years ago, a slim majority, 51.9 percent, voted in a referendum to leave the European Union. But breaking up is hard to do. Three times, Prime Minister Theresa May has proposed an exit plan. Parliament has rejected it each time. The March 29 deadline to depart has come and gone; Parliament has asked the EU for delay after delay. More than 6 million people have signed a petition calling on Parliament to revoke Britain's exit. Millions have marched to hold a second referendum, hoping the result might be different the second time around. From across the ocean, it doesn't look as if a lot of Britons are eager to Brexit at all. This week, a leak in the roof of the House of Commons forced MPs to suspend debate. Between drips, Labour Party Member of Parliament Justin Madders told a nearly vacant chamber: "I think there is probably some kind of symbol about how many people view how broken Parliament is going on there." Perhaps there is a lesson in a report this week in the journal Science Advances, about new findings from ceremonial sites around Stonehenge. Something in the standing stone slabs in that ancient ceremonial site seems to signify stony British steadfastness. The Neolithic builders of Stonehenge held large feasts where the celebrants roasted huge pigs and — every now and then — a cow. Whatever may be written on the slabs of Stonehenge, it probably wasn't "Vegan Options Available." Scientists had always assumed the doomed swine were local. Farm-to-table cuisine — or in those days, "herd-to-hut"? — was kind of necessary in the Neolithic period. But recent isotopic analysis of pig remains from several ceremonial sites in the area show that the swine and celebrants sometimes came from as far as what's now Scotland and Wales. In the Neolithic era, that must have seemed like the ends of the Earth. Richard Madgwick of Cardiff University, lead author of the study, says, "These gatherings could be seen as the first united cultural events of our island, with people from all corners of Britain descending on the areas around Stonehenge to feast on food that had been specially reared and transported from their homes." What this might mean in our times is that even when the slabs of Stonehenge were being raised, people understood they were stronger together than apart. And when they found a way to come together, it was something to celebrate. It has not been uplifting for Americans to look across the ocean the past few years and see Great Britain's Brexit imbroglio. Almost three years ago, a slim majority, 51.9 percent, voted in a referendum to leave the European Union. But breaking up is hard to do. Three times, Prime Minister Theresa May has proposed an exit plan. Parliament has rejected it each time. The March 29 deadline to depart has come and gone. Parliament has asked the EU for delay after delay. More than 6 million people have signed a petition calling on Parliament to revoke Britain's exit. Millions have marched to hold a second referendum, hoping the result might be different a second time around. From across the ocean, it doesn't look like a lot of Britons are eager to Brexit at all. This week, a leak in the roof of the House of Commons forced MPs to suspend debate. Labour MP Justin Madders told a nearly vacant chamber between drips, I think there's probably some kind of symbol about how many people view how broken Parliament is going on there. 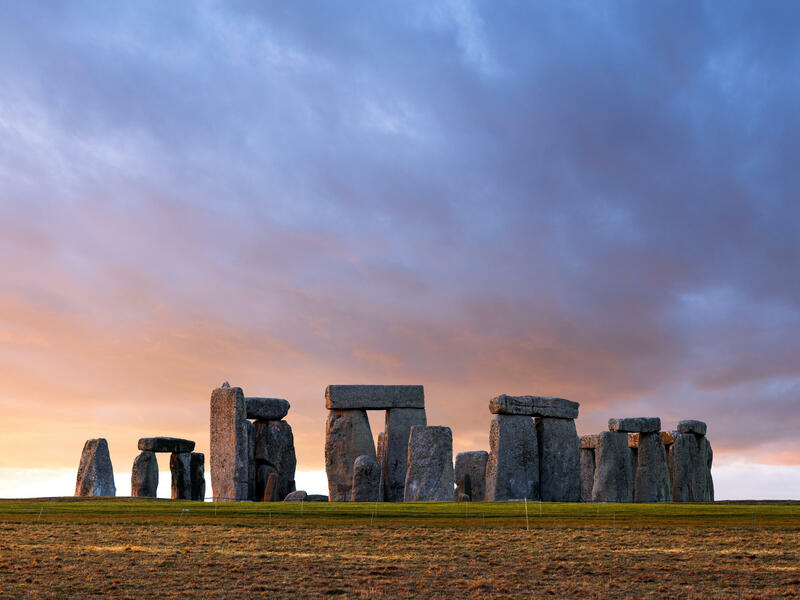 Perhaps, there's a lesson in a report this week in the journal Science Advances about new findings from ceremonial sites around Stonehenge. Something in the standing stone slabs in that ancient burial ground seems to signify stony, British steadfastness. The Neolithic builders of Stonehenge held large feasts where the celebrants roasted huge pigs and, every now and then, a cow. Whatever may be written on the slabs of Stonehenge, it probably wasn't vegan options available. Scientists had always assumed the doomed swine were local. Farm-to-table cuisine or, in those days, herd-to-hut was kind of necessary in the Neolithic period. But recent isotopic analysis of pig remains from several ceremonial sites in the area show that the swine and celebrants sometimes came from as far as what's now Scotland and Wales. In the Neolithic era, it must have seemed like the ends of the Earth. Richard Madgwick of Cardiff University, lead author of the study, says, these gatherings could be seen as the first united cultural events of our island with people from all corners of Britain descending on the areas around Stonehenge to feast on food that had been specially reared and transported from their homes. What this might mean in our times is that, even when the slabs of Stonehenge were being raised, people understood they were stronger together than apart. And when they found a way to come together, it was something to celebrate. (SOUNDBITE OF MAEVE GILCHRIST AND VIKTOR KRAUSS' "SPLIT WINDOW") Transcript provided by NPR, Copyright NPR.